This section provides information for booking and organising your visit. 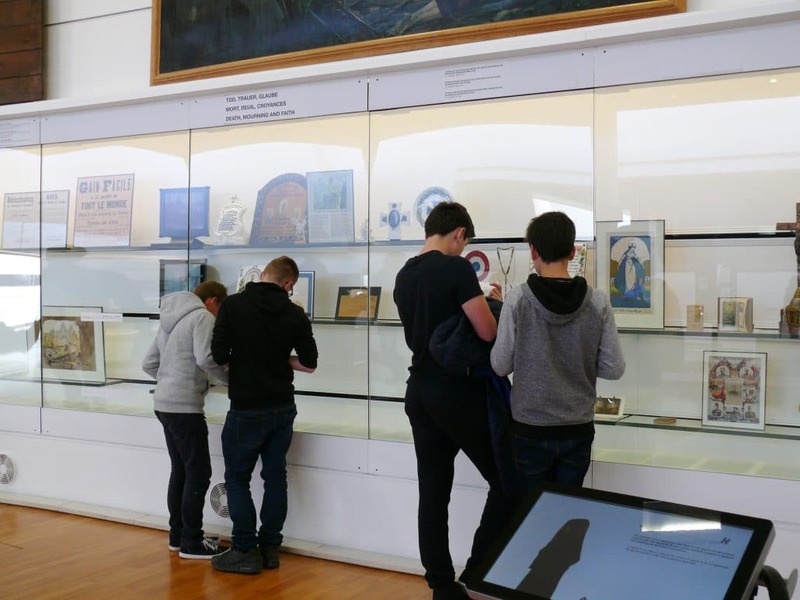 When visiting the Historial, school groups can choose between a wide variety of activities both inside the museum and outside in the town of Péronne or on the battlefields. Please note: guided tours within the museum are not available for school groups. Guided tours: guided field trips are available in complement to the museum visit. A half-day tour of the Remembrance Trail accompanied by a Historial guide. The tour usually includes three sites: Lochnagar Crater in La Boisselle, Beaumont Hamel Newfoundland Memorial Park, and the Thiepval Memorial. Through these sites the students will learn about the Battle of the Somme, from the battles that took place in 1916 to the importance of remembrance. Workshops complement the museum visit. Conducted by a teacher from the Education Department, the workshops take place in the school room (duration 1 to 1.5 hours) and study topics chosen by the teacher from a list provided. In order to provide the best possible service, it is essential for us to regulate the flow of visitors in the museum. In consequence, school groups must book their visit by contacting the Education Department’s secretary: email educ@historial.org ; tel +33 (0)322835414 from Monday to Friday. Teachers will then be asked to confirm their booking by signing and returning the various documents (commitment charter, reply coupon, method of payment). If the Education Department has not received these documents within three weeks of the visit, the Historial reserves the right to reallocate the booking to another group. Rucksacks must be left in the coach or the picnic hall provided for your school group (available only to school groups that have booked a full day of activities and subject to availability). Only pencils are allowed in the museum galleries. For the conservation of light-sensitive artefacts, camera flashes are prohibited. Students remain under the responsibility of their teachers at all times. The direction of the Historial de la Grande Guerre Association declines all responsibility in the case of theft, loss or damage to personal items.